« Artificial organs – science fiction or reality? Wilde’s persecution and exile have been regarded by some as a “crucifixion”. There has been a crucifixion, so, it follows; there must be a resurrection. Such is the power of the narrative; of the myth-making machinery that operates in our culture in the creation of icons. Oscar Wilde has a remarkable capacity to touch the lives of the twenty-first century reader, to make people feel as though he is someone with whom they are so familiar that it is as if he is their personal friend. In fact, at times, he seems so contemporary and like “one of us” that we could be forgiven for thinking he is alive and well and living in the twenty-first century. The word that always springs to mind when considering such notions is “spirit”. Indeed, over the past century, there have been numerous reports from people, claiming that Wilde has “appeared” to them, or has been “spotted.” One sighting, by a student at Magdalen College in 1934, claimed that he was seen drifting across the College quad in his graduation gown. John Stokes in his book, Myths Miracles and Imitations, writes of Wilde having been seen in New York in 1905 and again in 1912 by his own nephew, Arthur Cravan. In the latter example it is a dark and rainy night … and the apparition of Wilde appeared to Craven in his flat. According to Stokes, Cravan turned upon Wilde and abused him, but, suddenly overcome by pity, ran after him, calling his name and, when he realised Wilde had gone forever, he returned a desolate man. Such a story seems to me to provide the perfect metaphor for the history of Wilde’s cultural reputation. It is almost a story in miniature of his fall and subsequent rise to glory. He was abused, he fled this world and now that world is sorry and wants to call him back, so much so that wishful thinking sometimes overflows into belief that he has been “seen”, spotted somewhere. Elvis Presley also has the capacity to generate such rumours. Elvis has been “seen” in some fairly surreal situations: pushing a trolley full of fish fingers outside a supermarket in L.A., where his Cadillac was parked in the disabled spot; eating a meal in Burger King wearing a white robe (what else do ghosts wear? ); washing his smalls in a laundrette in West London, telling the attendant “you ain’t nothing but a hound dog” when they ran out of soap flakes. There have been various attempts to make “contact” with Wilde. Perhaps the most amusing case was the recording made of the late Leslie Flint, a famous medium back in the 1960s. The point of these ramblings about sightings and so forth is that such cases are illustrative of the power of personality – the power of the spirit. Aided and abetted by the advent of the media and its rapid expansion since Wilde’s time, some of that power is accrued through the reproduction of images, the Oscar Wilde industry, as it has become known. Although dead for over a century Oscar is very much alive to us, not simply in the sense of being immortalised through his works as indeed many authors are, but because he was – is – larger than life – because he was more than a writer – he was a celebrity. Like many celebrities, such as Elvis Presley, it is hard for many to believe that he is dead. He is so much a part of modern life that it is hard to believe he died all those years ago. Wilde, in the manner of a spirit, retains a “presence” – one might be tempted to say “omnipresence” – within popular culture. Of particular note is Wilde’s appeal to the teenage demographic, an appeal which is at least in part due to the fact that he speaks to the outsider in people. It is no wonder then, that the author Michael Bracewell had, he confessed, two posters on his bedroom wall when he was growing up: one of David Bowie and one of Oscar. “Bowie came down after awhile”, he noted. “But Oscar stayed.” Stephen Fry too, noted that teenagers “trembling on the brink of bourgeoisification” look to Oscar as an inspiration. Indeed, there is a certain fragility about his position in Victorian society, his status as a wit and an artist – that seems to provide the perfect metaphor for the struggle against conformity endured by young people, especially teenagers, for whom individuality (a.k.a. identity) is vitally important, but who are all too keenly aware of their vulnerability to the ravages of social pressure. Wilde’s brief career is very “teen”, in the sense that it represented a brief oasis of self-expression, flourishing in a desert of conformity. It was all too quickly quelled, he was packed off to prison where he was stripped of his individuality, had to wear a uniform and to do what he was told. He can be regarded as a metaphor for those with artistic aspirations who maybe cultivated an interesting style for just a few brief years of their lives, before they have to forsake themselves and end up working in an environment that does not make room for individual expression. Like the 1890s itself, his was a flame that burned too brightly and was all too soon snuffed out. Of course, Wilde does not merely appeal to teenagers. HE appeals to people from all walks of life. He has, albeit posthumously, become a figurehead for a whole range of communities, that have gathered around him, fought over his legacy and claimed him as their own. The main one of these is, of course, the gay community. Over the years, much has been written about Oscar’s gay identity, about whether or not he would care to be seen as a “gay” author. On the centenary of Wilde’s death, thousands of people came from all over the world to pay their respects, leaving flowers and messages at his graveside, such as, “love you always” and “I will keep you forever in my heart”. One message, written in French, said, “For Oscar Wilde the outraged martyr, who died in the name of love”. 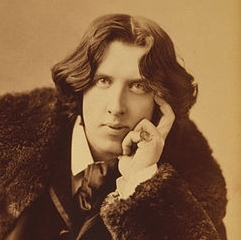 The notion of Wilde as a modern celebrity is a frequently discussed one. In the twentieth and twenty-first century, with artists and celebrities becoming, for many people, like Gods or Guru figures, Wilde and his reputation fit with ease into this cultural template. Wilde himself would perhaps not be surprised, living as he did in a culture where this had already started to happen, when the spiritualist Madam Blavatsky was looking to nominate her guru to popularise spiritualism and when actresses like Sarah Bernhard were commanding the kind of adulation now given to stars like Madonna and Kylie. Indeed, Wilde himself commanded such adulation, when on his American tour with his manager and publicist, the Victorian equivalent of Max Clifford. Wilde epitomises the spirit of our time and that is why it feels as if he is alive and well and living in Chelsea, or Paris, or wherever one might picture him to be. As Ellmann so aptly pointed out, “he belongs to our world more than to Victoria’s”. After a decade of celebrations Wilde’s “resurrection” is finally complete and he is restored to us in all his resplendent glory. Tagged books, celebrity, gay, oscar wilde. Bookmark the permalink. As a fan of Oscar Wilde, I found this article very well written and interesting. I agree with Julia in that Oscar Wildes creative spirit and suppression of identity is what drove him to be so expressive in his works. However, I felt that some of the things said could easily apply to a number of ‘celebrities’ including the aforementioned Elvis Presley, Shakespeare, Marilyn Monroe & other ‘tragic’ characters of life past and present who have made an impact on the lives of modern culture. Each community in society seems to claim a non-conformist or trailblazer as one of their own or hails them as a great icon or hero. This is such a fascinating commentary on Oscar Wilde – your knowledge of his life is second to none! Great article!